Mead honey wine is a healthy and nice drink: ancient poets sang of its dignity, and in some countries people drink it in various forms, from light sparkling honeys to sweet and highly alcoholic wines. Other countries, on the contrary, use it rarely, as the ordinary wine is a strong competitor to mead, which can not compete with it. 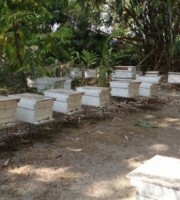 Indeed, the cost of honey does not justify its conversion into a drink and honey wine only imitates the grape wine. The mixture of water and honey has a very slow fermentation, during which it produces bad enzymes, slowing the formation of alcohol, and the juice has more or less bad taste. Trying to avoid this they added the yeast, but they gave a bitter taste, the addition of raisins gave bad quality enzymes, and, moreover, changed the very nature of the drink, and the pollen was added, but not every pollen has a pleasant taste. 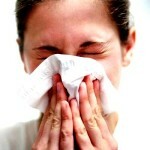 The right thing to stop is a pollen. 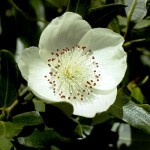 It is also good to use yeast, obtained from the flowers of the plants from which bees gather nectar. Then you could have a yeast from white clover, lime, pine, etc. Honey wine would then have pure honey origin, beginning with the yeast and ending with the flavor, while yet it is in most cases only an imperfect imitation of grape wine. Honey does not contain salt, needed for fermentation, hence you should use nutrient salts. Add to the juice 5 g of this mixture per liter. This recipe, however, has a serious drawback – this composition of salts harms the taste. 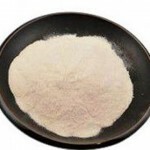 Tartaric acid content is very weak, as in all other recipes published so far, the wine should have more acidity. It should be at least quadruple the dose of tartaric acid. Potassium salt 1,5 g per liter. You can add 1 g of ammonium phosphate per liter, making the recipe better. These salts are food for fermentation enzymes and are almost entirely consumed by them. It is necessary to use it, unless you want to stretch the fermentation process for months. Nearly 20 years ago, they added 10 g. of basic nitrate of bismuth oxide to 100 liters of water to stop extraneous fermentation that occurs during prolonged fermentation, but they got rid of it now, using these nutrient salts. Alcohol content in wine depends as much on the amount of added water, as well as on the conversion of sugar into alcohol substances in the juice. The more perfect is the fermentation, the stronger is wine and less sugar content. If the conversion of sugar into alcohol is not finished, the wine is sweet, and if it has the small amount of the alcohol in it, it can easily spoil. Fermentation should take place at a temperature below 15 °С and up to 30 °С Celsius (12 – 24 ° Reaumur) (59-86 F), it lasts from two weeks to six months. 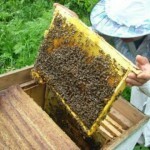 It can be even more, if you put in a mixture a lot of honey or if the temperature is not right. Fermentation is best at 20 – 28 ° Celsius (68-82 F). You can certainly do it in the overheated room, but it is easier to put the barrel to ferment in the shade in the summer, for example, under a canopy, covering it with straw mats or old carpets, when the temperature is much lower. For the production of honey it is better to use large vessels, the more liquid you put, the better is fermentation, since a large amount of liquid does not have time to cool down during the night. For the production of honey drink, which could be kept for years and will be like a ordinary white wine put 30 kilograms of honey per 100 liters of water, which gives the proportion of 250 grams per liter with containing from 10 to 10.5% alcohol. Honey should be well mixed with the water, just like pollen, and if honey is crystallized, you must first dissolve (heat) it. Take strained honey if you want to have a light wine. Observed that the turbidity of honey wine is sometimes because of the wax particles in wine as a fine emulsion, which can not be precipitated. Therefore, the water, in which they washed caps from combs, can not be considered a material for the production of high quality wines, and the presence of wax emulsion also affects the taste of wine. Barrel should be clean, without any bad smell, and should not be poured full, otherwise, due to fermentation the liquid will flow through the top. Bore of barrel is closed with twice folded piece of canvas, on which a brick is laid. To check the fermentation, it is enough to attach the ear to barrel. To speed up the fermentation process, if it is slow, you need to take some liquid from the barrel and then pour through the top hole back. When you cannot hear fermentation and liquid is transparent, it should be poured into another barrel, filling it completely, put in the basement and resealed. The loss of fluid due to fermentation, evaporation and releasing of yeast is 7 – 9%, so in order to pour 120 liters from old barrels, it is necessary to have a new one for 110 liters. The barrel can be topped up with white wine, if there is no ready honey wine, or put into a barrel well-washed stones, not limestone. Before pouring a drink in a bottle, you need to make sure that fermentation is completely finished, ie that all sugars turned into alcohol that can be understood by taste. You can make the taste of nutmeg, putting in a barrel during the fermentation a few leaves of sage (Salvia) or elderberry flowers, but it is not desirable to adjust the taste of the drink to some wine. Natural honey wine has its inherent flavor due to ether contained in honey, this characteristic feature should not be denied. Changing the taste of honey wine kills the very purpose of its production, and then it is better to use sugar instead of honey: the same result will be achieved more cheaply, because sugar is cheaper than honey. For someone who does not like the taste of honey, it is better not to make honey wine, because the purpose is a beverage that has the taste of nectar from the flowers, not the taste of yeast. 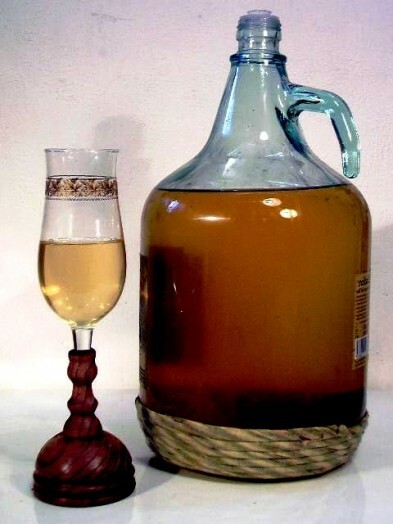 Increasing of the amount of honey in the mixture leads to a higher alcohol content, and fermentation is longer – if, for example, you put 50 kg of honey to 100 liters of water to produce a wine reminiscent of Madeira – conversion of sugar into alcohol is not fulfilled completely, as the appearance of large amounts of alcohol will stop the fermentation. After pouring the liquid in new barrel in the first year, you should not clog it too tight, and after, when pouring a drink in a bottle, you need to follow some precautions. Instead of pollen you can put into a mixture the fresh grape juice (one liter to a barrel) or the best yeast, available everywhere in the market. You can also put the chopped dried fruit or chopped dried grapes. Brewer’s yeast give the drink a bitter taste, and we do not recommend using them. 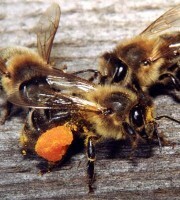 Taste of the drink varies, depending on the type of honey. From honey water you can make various fizzy drinks, pouring the mixture into bottles until the end of fermentation, but this requires some caution and experience to be able to catch the right moment. For such drinks you should use champagne corks and fasten it with string or wire. Grind 10 or 12 g of fresh pollen in a glass of lukewarm water. In addition put 300 g of honey in the same amount of water, add 2 g of tartaric acid, and boil for ten minutes, removing the foam.Then pour 2/3 liters of cold water and when the mixture is lukewarm, pour a glass of water with pollen. 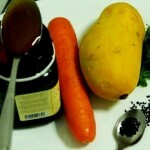 Pour the entire mixture into a small container and put in a bath of water at 25 – 30 ° Celsius (77-86 F). A week later, the mixture will have yeast elements in an amount sufficient to cause fermentation in hectolitre of honey water. Pour in a barrel with the volume slightly more than one hectoliter 75 liters of water. Melt 30 kg of honey in 30 liters of water, add 60 g of tartaric acid and boil the mixture for about a quarter of an hour, removing the foam, then pour everything into the keg and stir with a wooden stick, and then, when the mixture is cooled to 25 ° C (77 F), pour into the prepared barrel. Barrel should be in a room with a temperature of 20 – 25 ° Celsius (68-77 F). Fermentation begins on the third day and will last for about ten or twelve days, when fermentation calms down, take a third of the mixture and pour back again. When strong fermentation ends, close the barrel with a piece of canvas, folded in four, and put a stone. When fermentation is complete, ie glucometer of Guillot will stop at zero and a mixture has no noise, put the barrel in the basement for a week, then pour the drink into another completely clean barrel and add, shaking well, 10 g f tannin and 10 g of primary nitrate bismuth oxide, dissolving it in a liter of drink. Leave a barrel for eight or ten days and then pour the drink into a clean barrel, filling it completely. Drink can be poured in bottles only when the liquid is completely clean. Undoubtedly, sterilization and boiling of honey and pollen special treatment give correct, without any accidents, fermentation, but experiments have shown that these precautions are not necessary, just like adding salt of Gastineau if only you provide strict cleanliness and the required temperature. If honey is boiled with water, yeast (pollen or other yeast substances) should be put at the temperature 25 ° Celsius (77 F). 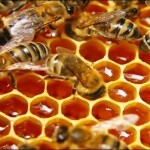 Honey can successfully replace the sugar that put in wine and cider for improvement. Honey is added to the grape juice before fermentation, the amount of honey is determined by the content of sugar in the grape juice. After washing lids and tools, which were used in the production of honey, we get honey water, which can be used for the preparation of vinegar (see below), or for the production of honey wine, but it is necessary to know the amount of honey, contained in water. Beekeeper can use glucometer of Guillot. Depending on what strength of wine you wish to get, water or honey are added to the honey water. Honey vodka is obtained by distillation of dry honey wine. If the wine is prepared for its subsequent distillation, the best thing is to take from 28 to 30 kg of honey to 100 liters of water and distill the drink immediately after the fermentation is over and the mixture is transparent, because the further keeping the mixture in the barrel always reduces the alcohol content. From good honey wine with good and careful distillation vodka is of excellent quality. 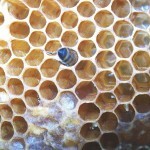 For making honey wine it is better to use lime or floral honey. Honey is diluted by half with water and get the mixture, which is boiled on a low heat, removing the resulting foam for an hour. When cooking it gets transparency and special taste, and frees from harmful bacteria and impurities that can degrade the quality of the wine. Method of manufacturing of honey wine is similar to cooking of fruit wines and includes the preparation of sweet wort and yeast ferment, the wort fermentation, clarification of wine with gelatin, filtration and pasteurization. Besides, sometimes making strong dessert wine, they bleach the mash by adding the required amount of alcohol during the early stages of fermentation. Sugars that are found in honey, are easy to ferment with yeast and fermentation of honey wine is not long, 3-4 days. 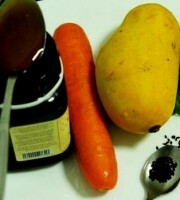 For the preparation of the wort put 250-300 g of mixture in one liter of water. The concentration of the wort sugars should be 16-18%. Feature of honey wine is low acidity, so you need to make additional acidity of wort to 0.8-1%. This can be done by mixing honey mash with berry or fruit juice, such as juice of white currant, apple, lemon, or other juices with high acidity. You can also use citric acid (7.5 g per liter of wort). Besides it is necessary to add nitrogen and phosphorus nutrition. For aromatic wines you can use different spices, which are put directly into the wort during the fermentation. During the fermentation of wort the sugar completely converts to alcohol, so the wine taste is sour, for sweet wines you should add boiled honey mixture (50-100 ml per liter). Honey wine yeast is better to prepare from grape yeast, but in the absence of such, you can use the ordinary yeast. When honey wine has alcohol level 12° you can add 65 ml of alcohol 96° per liter of wine. The result is a wine with an alcohol 18°. Honey wine with alcohol content 12-14° must be pasteurized. Wine of 16-18° does not require pasteurization. After cooking the honey wine is kept in a cool place for a few months. Keeping improves the quality of honey wine. 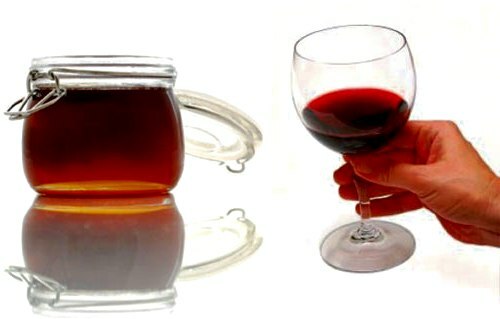 Strong honey wine can be stored for several years.Honey wines preserve all curative properties of honey, have a pleasant taste and delicate flavor and are great healing drinks. For 10 liters of water you take 2 kg of honey, 800 g of sugar and 40 g of dry hops, boil for an hour on low heat, removing the foam. Cool, pour into the fermentation tank, add nitrogen and phosphorus nutrition (0.3 g of ammonium chloride and 0.5 g of superphosphate per 1 l), 10 g of ginger, 5-7 drops of rose oil (lemon essence), 5 tbsp. of lemon juice and 1 tsp. of vinegar, pour yeast (1 liter) and keep to ferment under water seal. The wine is fermented for as long as the wort is not sweet. Then remove from the sediment and lighten, add 50 ml of boiled honey mixture and 50 ml of alcohol per liter, bottle and pasteurize at a temperature of 80 ° C (176 F) for 10 minutes. Cork stoppers are hot steamed, close the container and leave for storage. Take 2 kg of ripe cherries, pounded with pits, add 1.6 kg of honey and 10 liters of water. Cook on low heat for an hour. Cool, pour into a fermentation tank, add nitrogen nutrition and sourdough yeast (1l). Keep to ferment under water seal. 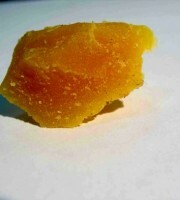 At the end of fermentation, drop a bag of pounded dried orange peel mixture (20 g) and bitter almonds (80 g). After 3 days, pour the solution of gelatin (100 ml of a 10% solution), stir and leave for clarification. After clarification remove from the sediment to bottle and pasteurize. 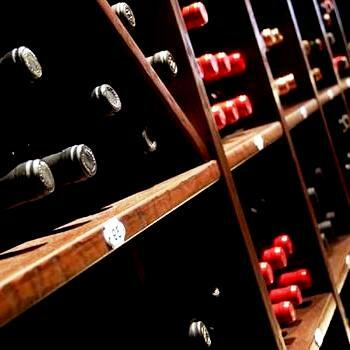 Wine can be stored for several months. Similarly, you can make wine with cranberry, raspberry, black currant and other red fruits. Take 5 liters of apple juice of sour apples, add 5 liters of water and 1.5 kg of honey, pour into the pot and cook on low heat within an hour. Then cool, pour into a fermentation tank, add the required components and yeast starter. Allow to ferment. After the rapid fermentation add 500 ml of alcohol. When the yeast settle and the wine lightens, drop a bag of crushed spices: 0.5 g of cloves, 2 g of cinnamon, 4 g of lemon balm, 0.5 g of cardamom and 1 g of anise. Add 2 drops of lemon essence and rose oil. Allow to stand for a month, often shaking. Then allow to stand for 12 days in a cool place, remove from the sediment and bottle. For 10 liters of water you take the 1.5 kg of honey and cook over low heat, removing the foam for an hour, pour warm into a fermenting container, add the juice of five lemons, nitrogen nutrition and yeast starter (1 l). Allow to ferment under water seal for 4 days, shaking frequently. Then pour a glass (250 ml) of strong alcohol and leave in a cool place for 10-12 days. Then remove from the sediment, lighten and bottle for storage. If desired, add honey syrup 30-50 ml per liter. Take 1.5 kg of white lime honey, add 10 liters of warm water and boil for about an hour, removing the foam, cool, pour into a fermentation tank and add 1 liter of good starter (grape) yeast, add nitrogen-phosphorus. Make 200 ml of broth of lime flowers (50 g) and hop cones (20 g), drain the broth into a fermentation tank and leave the mash to ferment under water seal. At the end of rapid fermentation (3 days), add a glass of alcohol, 2 cups of boiled honey syrup and 100 ml of 10% gelatin solution. Let stand for 12 days and remove from the sediment. In the clarified wine add 50 ml of tincture of Rhodiola rosea, In 3 days bottle for storage. Take 1.2 kg of white seedless raisins, pound in a mortar and shift into the pot, pour 6 liters of water, add 1.2 kg of honey . Cook over low heat, removing the foam, for an hour. Add water to the previous volume. Remove from heat, cool and pour into a fermentation tank with berries. Add nitrogen nutrition and sourdough yeast (0.8 liters). Mash is left to ferment under water seal until the transition of sugar into alcohol. Then add the gelatin solution, lighten, keep for 10-12 days, remove from the sediment. In the clarified wine add 150 ml of honey syrup, put in a cool place and allow to stand for two weeks. After this bottle and pasteurize. Store in a cool place. 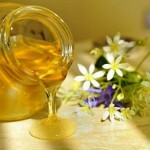 Looking at the recipe of honey wine it is possible to imagine that it very tasty. It would be desirable to try.